It was while studying law at Shiraz University that Hossein Raeesi first became interested in defending Human Rights. Noticing inconsistencies in the Iranian legislation, Raeesi spent many days discussing these issues with his professors and other students. In his senior year while researching a paper on prisoner rights he was granted an exclusive interview with the warden of Shiraz’ main prison, Adelabad, a prison that most recently has been cited as being part of a series of mass executions spanning ten years (1980-1990) that some have documented to have resulted in the deaths of almost 16,000 prisoners. It was also at Adelabad that he was deeply affected by witnessing one prisoner receiving his sentence of 70 lashes for petty theft. “I remember them strapping the man into a terrible bed-like contraption with holes for his arms and legs, and after 20 lashes the officer holding the strap remarking that he forgot how many lashes he had given and had to start over, I will never forget it.” The experience left a huge impression on Raeesi and he vowed from that day onward to devote himself to the area of understanding and defending people on the basis of universally established human rights. To date, Raeesi has been practicing law in Shiraz, Iran for over 20 years and has over a thousand cases to his credit. Although his main area of expertise is human rights especially with regard to women and children, he’s experienced in civil, business, employment, NGO, property, industry, domestic, criminal, human rights and sharia law. Raeesi has been credited with winning several high profile cases dealing with controversial issues like stoning of women, child executions, religious persecution, discrimination etc. 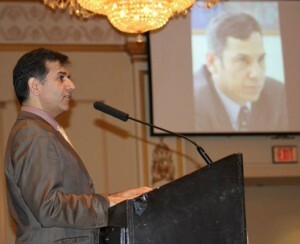 He left Iran to come to Canada in 2012, where he has continued working on issues related to Human Rights, criminal justice, death penalty, women and children’s rights, domestic abuse, constitutional law, Shariah law and jurisprudence, and their effects on individual citizens as well as the society at large. Raeesi is also a member and has served as a board member for the Fars Province Bar Association and Human Rights Council in Shiraz, Iran. He founded the Voice of Justice (Nedayeh Edalat) Legal Association in Shiraz as well. In 2015, he was selected by a joint committee of University of Ottawa and Carleton University to be an In-House Scholar and visiting professor. In this role, he has performed a number of speaking engagements and participated in panels. He taught human rights, Shariah law and the Islamic legal systems. He still actively maintains his law office in Shiraz, Iran working with a team of lawyers.